Leeds secured a seventh successive victory by beating Castleford in a keenly-fought West Yorkshire derby at a sodden Wheldon Road. 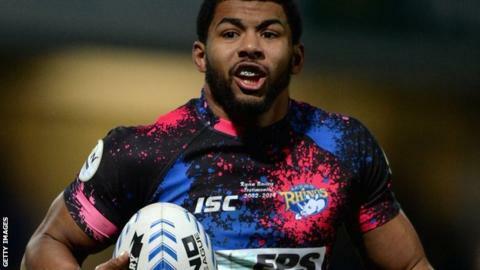 The Super League leaders were 14-12 down after uncharacteristically conceding two first-half tries. But having grabbed one apiece before the break, the visitors' Ben Jones-Bishop and Kallum Watkins crossed again to take the Rhinos in front. Victory takes Leeds three points clear of St Helens at the top. Castleford are a further two points back in third. In a breathless start, the teams exchanged several up-and-unders and Rhinos winger Tom Briscoe was the first to crack. His knock on gave Daryl Powell's men a platform for the game's opening try as Kirk Dixon crossed unopposed in the corner, and Marc Sneyd converted. The Tigers scrum-half stretched the lead with a simple penalty when a swarming defence dumped Briscoe over his own try-line after the winger had gone almost 10 metres beyond it. Then Brian McDermott's side showed the class that has seen them crowned champions in five of the last seven campaigns. Some wonderful flowing passes ended with a late offload by Watkins, who fed Jones-Bishop, deputising for the absent Ryan Hall, to squeeze over. Leeds have scored more tries (64) and made more metres (17,662) than any other team in Super League this season. After Sinfield converted, Cas rallied. Only an untimely slip from Daryl Clark stopped him crossing, and then a sensational last-ditch Danny McGuire tackle prevented Liam Finn going over. Moments later, after a penalty got them upfield, Leeds scored a carbon copy of their first try. This time Watkins turned scorer to put them ahead against the run of play, and Sinfield was again equal to the task of a tough conversion. Cas led at the end of an action-packed first period as just before the hooter, Sneyd danced around the Rhinos defence from 15 metres out and shrugged off Carl Ablett to slide under the posts and leave himself an easy goal. But the Tigers would not score again as the division's meanest defence absorbed everything thrown at them before grabbing two clinical scores. First, a clever cross-field kick from McGuire caused mayhem in the Tigers defence. Zak Hardaker gathered, offloaded to Watkins, who in turn fed Jones-Bishop in acres of space on the wing. Sinfield pushed the resulting goal attempt wide, but the Rhinos' next attack saw Liam Sutcliffe break the line and run 40 metres. A grateful Watkins was on his shoulder, and Sutcliffe obliged to let the centre slide over for his second of the night, and ninth Super League try of the season. Led by the guile of McGuire and Sinfield, Leeds then set about kicking deep and often. That starved the Tigers of territory, and successfully nullified what was a tiring attack, leaving the Rhinos to collect a 10th league win from their first 12 matches of the season. "We made nine errors in 17 sets in the second half and you can't do that against the better sides. "They deserved to win the game because they closed it out well with their kicking game. "We're learning some harsh lessons at the moment as we've come up against two of the top sides this week and have nothing to show for it. "The only complaint I'd have is that in the first half there was a lot of obstruction that went unpunished - we need better refereeing consistency." Castleford: Tansey, Dixon, Gibson, Shenton, Carney, Sneyd, Finn, Lynch, Milner, Mariano, Holmes, Webster, Wheeldon. Replacements: Huby for Lynch (22), Millington for Mariano (27),Hauraki for Wheeldon (27). Substitutes: Clark. Leeds: Hardaker, Jones-Bishop, Watkins, Moon, Briscoe, McGuire, Ablett, Leuluai, Sinfield, Peacock, Achurch, Clarkson, Delaney. Replacements: Bailey for Leuluai (17), Ward for Achurch (33), Sutcliffe for Clarkson (27), Singleton for Delaney (56).